Do what I say . . .
. . . and not as I do!! See this very badly photographed bundle of fiber? Not the lovely nests on the left. Look at the marbled roving on the right. That. 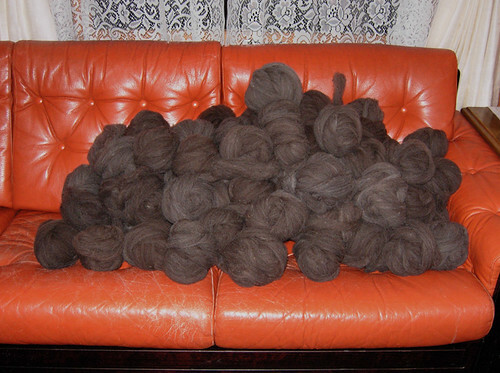 It’s a mix of mystery fine-wools that came in last year. There were about three partial fleeces, and they came in at a time when I was on the road and had neither the time nor the opportunity to do anything with them. Nor did I have the room in my luggage to get them back home. So, I did the unthinkable. I gave them a cursory look, packed them up, and sent them out for someone else to worry about. The fleeces had been requested—and sheared—about three years earlier, and I’d chalked it up to a learning experience; I never expected to see them. Nor do I know what I received. What was originally ordered didn’t entirely match what was in my hands. I could make a couple of educated guesses, but in the end I genuinely have no clue what I had received, other than that they were all medium-fine to fine wools. The staple length was about the same for all of them, but the colors varied between a solid near black, a chocolate moorit, and a Jacob-like variation with a grey and white patch. However, they were full of foxtail-type seeds. Mom and I went through and pulled out a large bowl of the things, and I knew that as dense as the locks were, there were bound to be more buried in the fleece. But there was going to be no way of really seeing the things without giving the fleeces a proper scouring—and that was something I couldn’t do at the time. 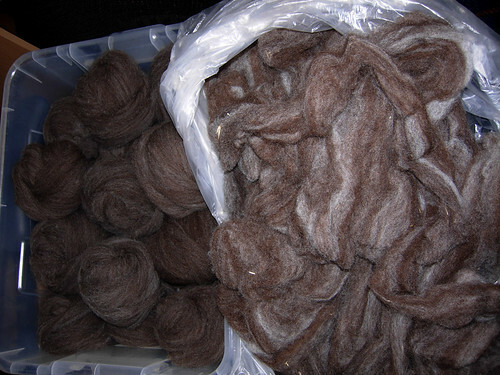 Together, the fleeces came out to be about 5 pounds, so I sent them all off to Morro to scour and do the initial carding but not take any further. What I did not do was properly evaluate the fleeces, and I should have. At least one of them must have had a degree of second cuts or weak tips—and given the weathering on the locks, I’m betting the latter. But carding with the seeds that didn’t come out in the scouring didn’t help the fiber much, and there are a certain amount of neps in the roving. And, of course, there are still remnants of the seeds. Don’t get me wrong: Morro did a wonderful job given what they had. I genuinely do not believe anyone could have done better. The flaws in the roving are entirely mine. You know the GIGO rule (garbage in, garbage out). Well, it wasn’t garbage, but it wasn’t what I would have sent had I been thinking and had I had any time at all. 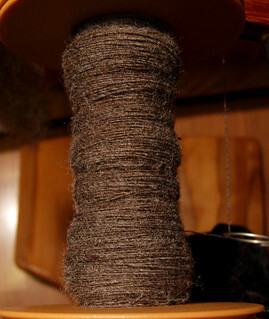 It’s a lovely dark moorit with a grey cast, and it spins just beautifully. And the combing waste? Those neps and odd bits? They’re going to be stuffed into a pad for a pet bed along with some other processing waste bits and leftovers that I’ve been gathering, and a bit of a badly stained down fleece I never had the heart to mulch. We’re getting into winter, our floors are cold, and I’m sure my brother-in-law’s guide dog would like something warm and insulating for his visits, especially given the fact that labs don’t tend to have much by way of coats of their own. This won’t exactly have been a cheap experience, but I can’t say that I truly regret it. Having Morro do the initial prep has saved me a lot of time and energy, and rough-combing the roving has been a pleasure. So, what’s the moral of the story? Well, first of all, there’s always time to evaluate a fleece. Always. Even if you have to put it on the shelf for another year before you do. Wool has no expiration date. Just check it enough to be sure it’s dry, that there’s nothing which will cause rot, infestation, mold, and so forth, and put it aside until you have enough functioning grey cells to deal with it. Second, and perhaps equally important, there’s nothing which says you have to settle for something with which you aren’t entirely happy. Assuming the fiber is sound to begin with, there’s no reason you cannot take one prep and modify it into another, no reason you cannot change it, use it for an ingredient in something else, and so on. In this case, rough combing gave me exactly what I wanted. It’ll make a wonderful sweater lot of a 4-ply.